This website has been the home of the Irish National Seabed Survey (INSS) for six truly important years in the evolution of Irish marine science. The remainder of 2006 and future years will see INFOMAR building on the achievements and coverage delivery of INSS to date. In only six years, Ireland has developed a world-leading reputation for seabed mapping including methodologies, human capacity, know-how and physical infrastructure. This was accomplished through the successful implementation of INSS. 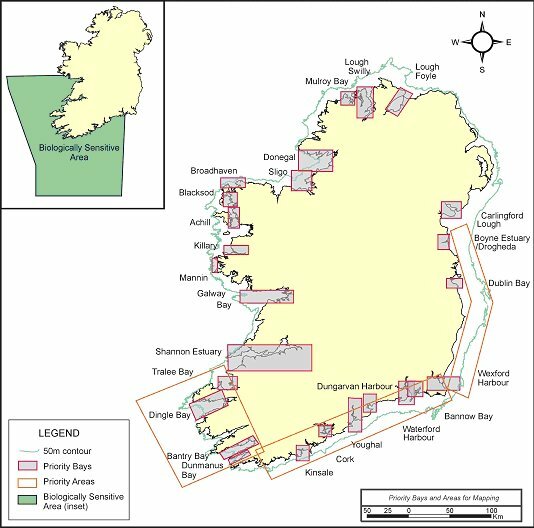 To date, the majority of the Irish continental marine area has been mapped for an INSS investment of €32M, producing over 300 paper-based charts and a total of 5.5 Terabyte of digital information stored on the INSS database. Now it's time for a successor to INSS - INFOMAR: INtegrated mapping FOr the sustainable development of Ireland's MArine Resource. 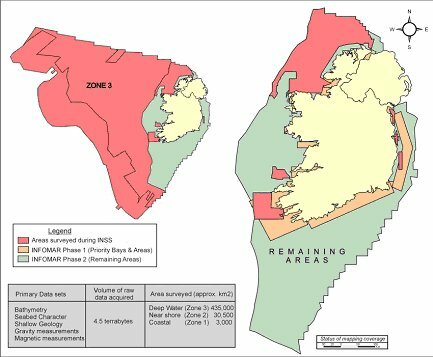 INSS started surveying at the outer margins of Ireland's territorial seabed and worked its way towards the shore.The map above shows the coverage achieved to date and areas that remain unmapped under the programme. Perhaps the most crucially important body of work now looms - the mapping of the commercially valuable inshore areas. An extensive stakeholder process has been ongoing since 2002 to identify inshore priority areas for mapping. This has resulted in the identification of 26 priority bays and three coastal areas as shown on the map below. In 2006 INFOMAR is beginning to map these areas starting with Dingle Bay, Kenmare River approach, Bantry Bay, Dunmanus Bay and adjoining offshore areas.